It’s confession time. 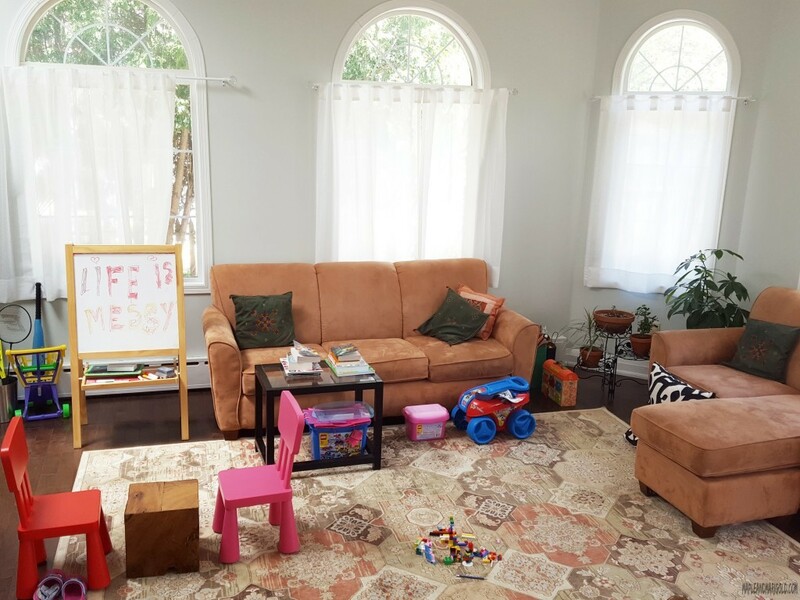 With two kids, their host of friends, a backyard and the constant in and out, my home is usually a mess. Artwork drying on the railing, unfinished Lego on the carpet and how can I forget the kitchen. While our home is messy I do like a clean home if you catch my drift. Floors and upholstery, scuff marks and sticky spots – all have to addressed every day. So vacuuming is a big part of my regular routine. Family and chaos coupled with daily meals and snacks, most days our living area isn’t ready for unexpected guests. This is after owning a vacuum cleaner, an older Dyson with a canister and an occasional cleaning lady who brings her own equipment. Even then the mess is like railing against the wind. 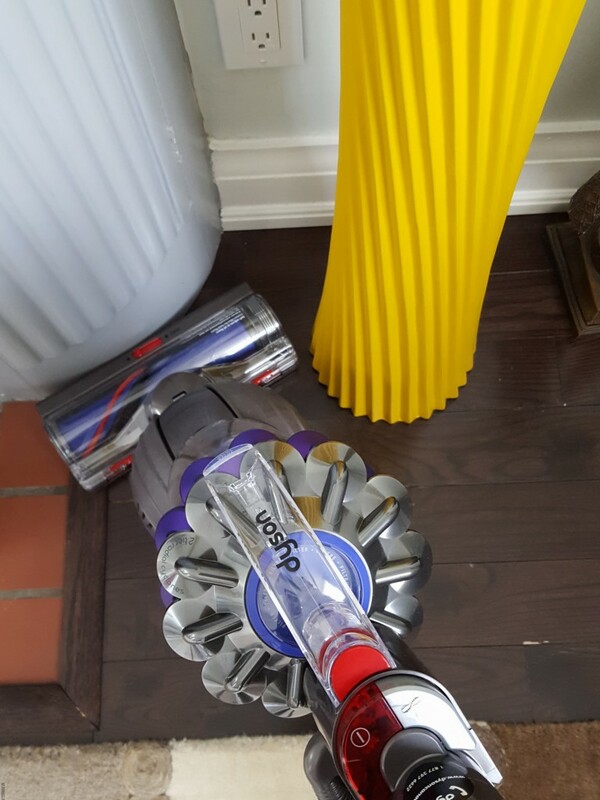 So when I received a new Dyson Small Ball to review I was excited to not only test it in my home but also to share the results with you. Spring is here (if we ignore the crappy Toronto weather coming up this weekend) and windows are open to bring the weather indoors. But what also comes in with fresh air is dust and that’s where vacuuming is so critical. Both my kids have allergies and spring time along with the dust is a battle in our home. 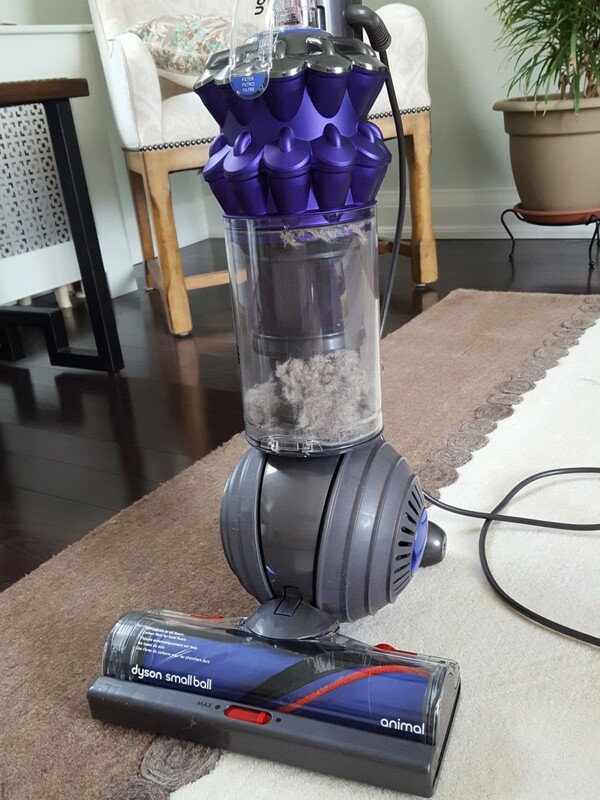 I had a plan – to test the Dyson Small Ball vacuum the day after the cleaning service visited so it would be good way to compare. Full disclosure: I wasn’t at home to see how the job was done the previous day but the cleaning ladies are usually reliable, and I couldn’t see any dust when I started. But as I realised, just because I couldn’t see the dust did not mean it was not there! This the result of vacuuming a small living room with an area carpet ONE DAY after it has been cleaned. The small ball of the vacuum cleaner, and it’s ability to move the handle sideways made it really great and flexible for getting into the small spaces and to approach baseboards at an angle. I hate stopping to move things around when I’m vacuuming so if I can reach corners without tipping anything over then that’s a big plus in my eyes. The Dyson Small Ball was good at this. It’s lighter than what I’m used to (5.5 kgs) so I can carry it up and down the stairs with ease. Plus my 10 year old can use it to clean up. She may not want to but that’s another story! The cleaning hose is longer than what I’m used to (almost 13 m) so I can reach up the stairs without the need to turn off the machine and carry it up and restart again. Love the pop of purple colour so if I leave this upright in a corner by the fridge while I get other stuff done it doesn’t look too bad. It kinda distracts from my clutter. The ability to clean effectively and switch between carpet and hardwood and ceramic floor seems to be standard across other upright vacuums. I do like that there is an option to go easy on the the suction for more delicate carpets and flooring. There are a few other tools that come with the Dyson Small Ball that are quite useful – like the Tangle-free turbine for long hair. I can see it’s importance in a home with pets, or teenagers with long, uncombed hair. I am still a few years away from that situation! Whew! Overall the Dyson Small Ball was a keeper. It’s easy to assemble, use and even easier to empty and store. I do wish the extra tools came with a matching purple bag that would add a little pizzazz to the boring job of cleaning the house. 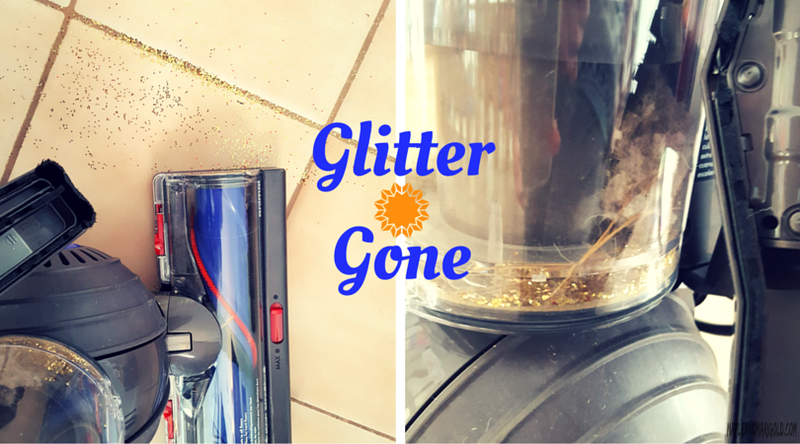 But as a mother and the primary home maker (that’s a separate conversation right there) I hate glitter and when I saw this vacuum cleaner clean up that creative mess I can tell you – it works! Disclaimer: I received free product to conduct this test and review for my readers. The narrative and opinion as always is mine. Love your living area! Looks so cozy. And I will checkout Dyson Small ball next time I am in market for one! Time to get new cleaners?? But that’s crazy! By the way love your living room and the light- those windows <3!! the dysons are awesome! and that glitter – woah.